The dangerously beautiful Deirdre Cantor is determined to inherit her grandfather's vast fortune. All she needs is to marry a duke . . . and be the first granddaughter to walk down the aisle. After all, she has always dreamed of becoming a member of the haute ton. So when the proper Calder Marbrook, the Marquis of Brookhaven and future Duke of Brookmoor, is abandoned at the altar, Deirdre makes it her business to become his wife-in spite of the whispers about his past. Soon Deirdre's visions of a lavish existence with the handsome Calder are shattered when she learns his shocking secret. Feeling betrayed, Deirdre seeks revenge by playing a perilous and seductive game of cat and mouse with her husband that threatens to drive them both to the heights of passion. She will not surrender to him, no matter how great her desire. But at what cost? 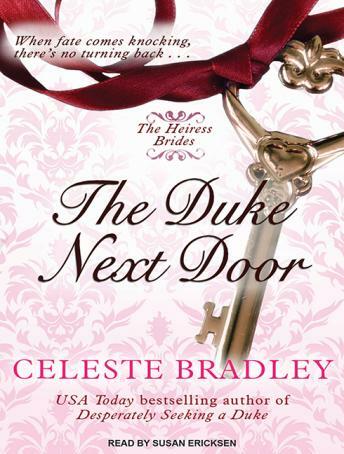 Calder is determined to keep his secret under lock and key-and to make his stunning wife his in every way that matters. Even if it means winning her heart all over again.